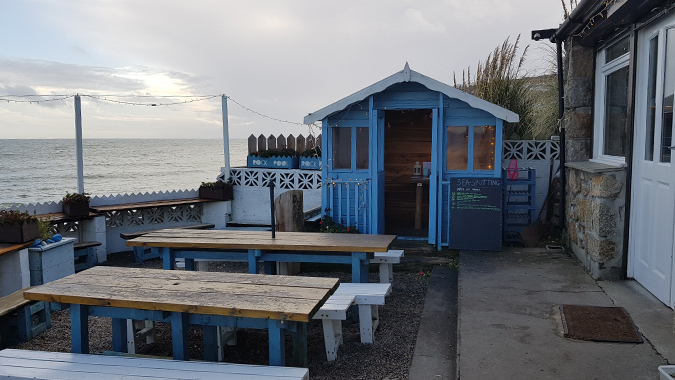 I’m really enjoying this blog series as it’s turning into a bit of a weekly gratitude post. While I’m not able to go on weekends away, dine in fancy restaurants, or treat myself to shiny things, I’m incredibly fortunate that I’m able to work flexible hours and spend quality time with my son, I have incredible family and friends who live nearby, and an ever-growing pile of books to read. Sometimes the little things are really the big things. Here’s a look at what I’ve been loving this week. Jenson is going through a toast for breakfast phase, so I’m trying to think of alternatives to sandwiches for lunch to avoid overloading on bread. 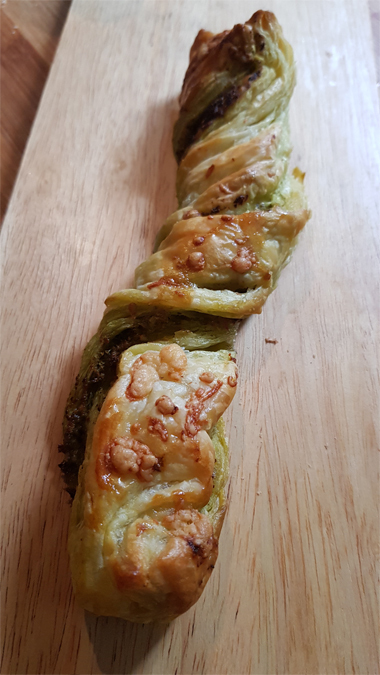 I did a quick Google of recipes and came across these cheese and pesto twists on Scrummy Lane. They’re super easy to make and sooo tasty, especially when they’re still warm. I’ll certainly be making these again. And Jenson loved them. Bit proud of my baking skills/ability to follow a recipe. 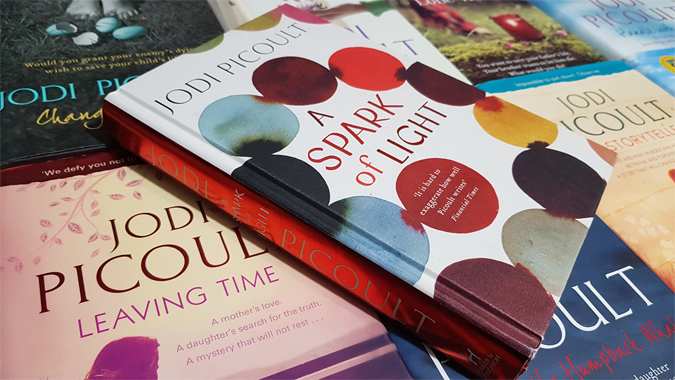 Last weekend my most anticipated book of the year dropped through my letterbox: A Spark of Light by Jodi Picoult. I’ve read all of her adult titles and have been pre-ordering her new releases for the best part of a decade. I’m always fascinated by her ability to take something topical, which is widely debated, and make the reader see both sides. She’s previously tackled suicide, high school shootings, racism, religion, and now she’s put abortion centre stage. It’s as hard hitting as you’d expect and so well researched and put together. Highly recommended. On Thursday I treated myself to a solo shopping trip. Yep, that’s how exciting things are getting around these parts. As I’m always with Jenson, he usually gets dragged around with me, wanting to be carried, which limits how much shopping I can actually get done. This time I left him with Luke and headed off to pick up some click and collects and gather some Christmas presents. And it felt amazing. i can’t remember the last time I had the freedom to actually browse in a store rather than just run in for what I needed, trying to avoid a meltdown. 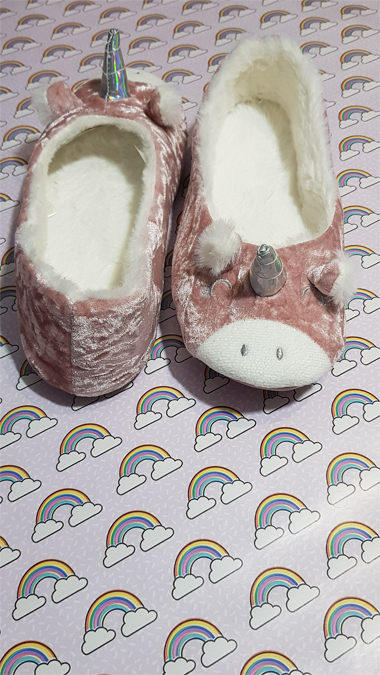 When Tu Clothing had 25% off recently, I ordered slippers for myself, Jenson and Luke – I know, we’re such party animals. But look at how cute these unicorn ones are. And they’re super soft and comfy. A few weeks ago I mentioned that Jenson’s nursery had created an individual action plan to help with him his self-confidence and to engage more with other people. We were told we’d review it after six weeks and when we went in for an update earlier this week we were so pleased with his progress. He’s coming home talking about his day and, after telling us about what he ate, he eventually goes on to list the names of children he played with, mentioning the same three names most days – he has friends! Considering a month or two ago he was still happy to play independently on the outskirts of a group activity, it’s great to hear that he’s choosing to play with other people. The nursery staff have noted a significant improvement in his confidence and communication with others, which is so reassuring. I think we’re almost ready to start potty training too. 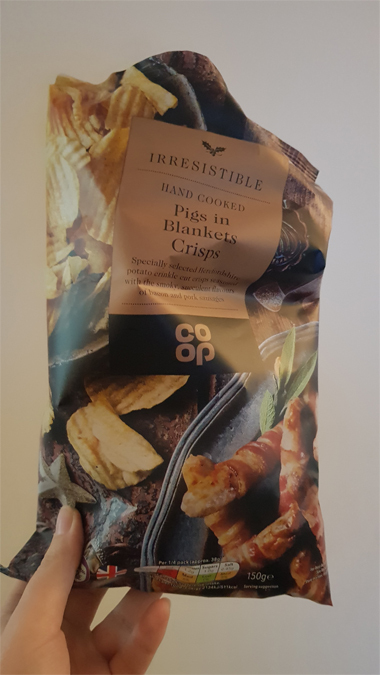 Luke nipped to the shops the other day and came back with these pigs in blankets crisps from Co-Op. Holy crap, there are no words for how amazing these crisps are. 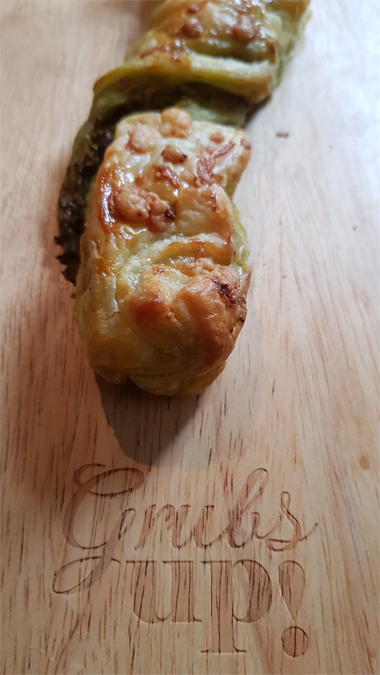 They’re my new favourite and, for that reason, we can never buy them again. The large packet sizes certainly don’t help. I had planned on spending the day at home with Jenson yesterday. 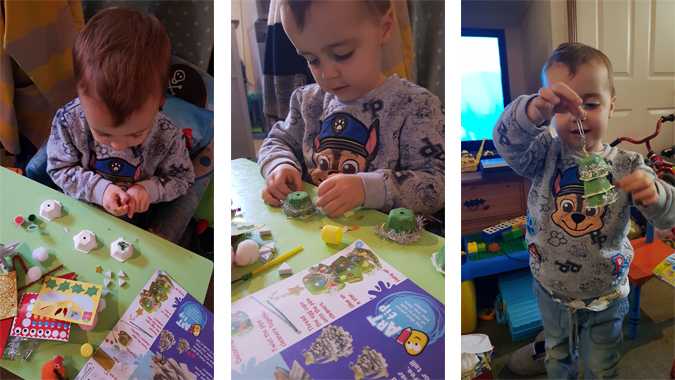 We didn’t have any plans to see anyone or do anything, which made me feel a bit bad, as being stuck in all day isn’t fun for either of us, but we had some Christmas crafts to do thanks to the Cbeebies art magazine. 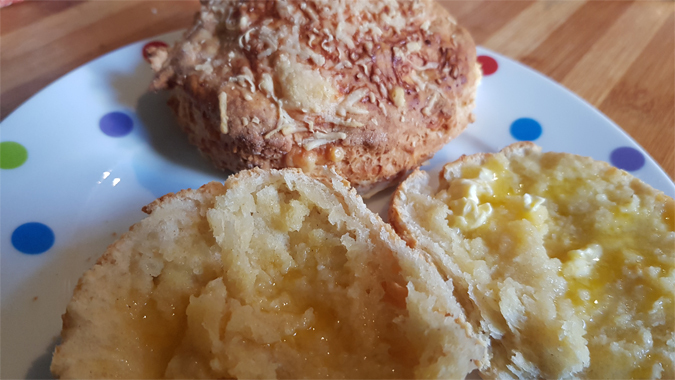 I also had a crack at these cheese scones. I left them in a couple of minutes too long but they were still tasty when buttered straight from the oven. 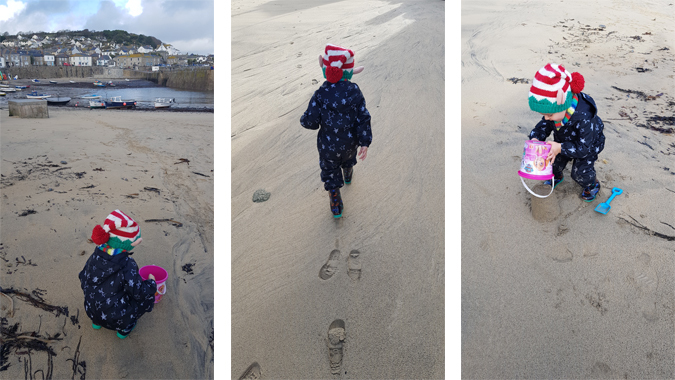 After lunch, Jenson asked for an adventure (he remembers our St Ives trip well) and I was happy to oblige. 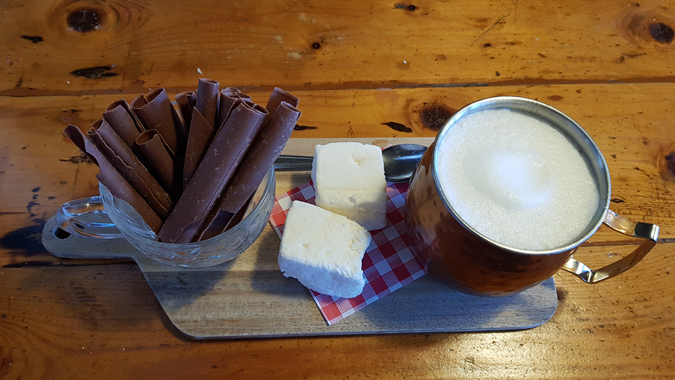 We got the bus over to Mousehole, made some sandcastles, wandered along the harbour, climbed up to the Rockpool Cafe, and shared the most epic hot chocolate. We then called into the park on the way home, got caught in the rain, and headed home for a brew and a catch up with Aunty Toni. I told him she was popping round while we were walking back and he said: “Toni loves playing Fireman Sam”. Dear of him. I don’t think she had a choice. We’re popping out for lunch with my brother and the fam today. Jenson misses his older cousin now he’s at school and they play so nicely together these days.